We received a very positive note from one of our long time customers, Dale, concerning his use of a couple of our diesel treatments Dee-Zol and Super-Tane. By his count, he gained an extra 2 mpg on his trip – about 10% improvement. Thanks for the efficient and beyond the normal response to my dilemma. I previously communicated with you about a mix-up in the order. After contact with Demetrius (sic), I was impressed with his follow thru on my order. When it was clear the order was delayed, he made sure I was able to receive my product on time for a major November trip, where weather was expected to be severe. I was impressed with the integrity of the Team at Bell Performance. The Team followed up on my request and needs with efficiency and integrity. Integrity has always been a major part of my family since the early 1900's. Bell Performance performed beyond my request and expectations. As expected on my 2400 mile trip in November, your products improved my mileage significantly. In one fueling stop, the fuel was a winter blend (Montana). 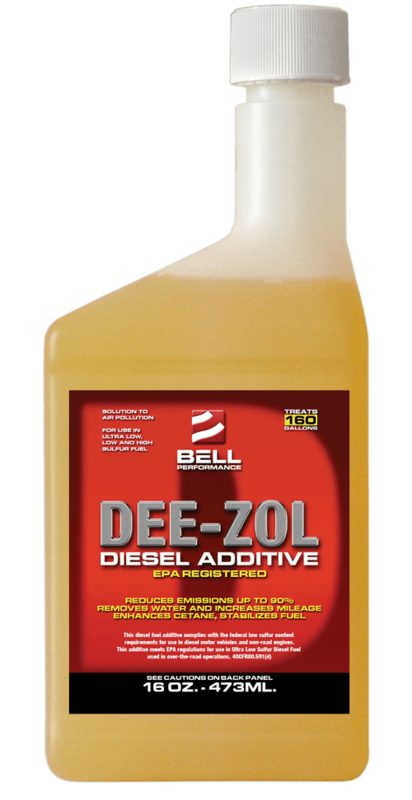 I put extra Dee-Zol and Cetane Improver in the tank and was able to recover my cost and performance. This year with identical driving in 4-wheel "granny", the digital readout on my Dodge 4x4 indicated 2mpg improvement in the low end driving. I used the oil additive and the Dee-Zol. My trip home was moved up because of a severe dental problem. I drove hard and long, averaging 62-63 mph. The weather was nasty with intense wind/rain gusts. Performance was superior. My overall return trip to Washington from Montana for 843 miles achieved 21.8mpg. Superior performance with a superior (sic) products. I like Bell Performance. Thanks, Dale! Just for the record, a 2 mpg improvement is about a 10% improvement in mileage. But what does that look like in terms of savings? Retail diesel price at that time (November 2015) was about $2.45 a gallon. Based on his before and after mpgs over the 843 mile trip, Dale saved almost $9.50 in fuel on that trip alone, while spending less than $4.00 to treat the fuel. So Dale doubled his money.